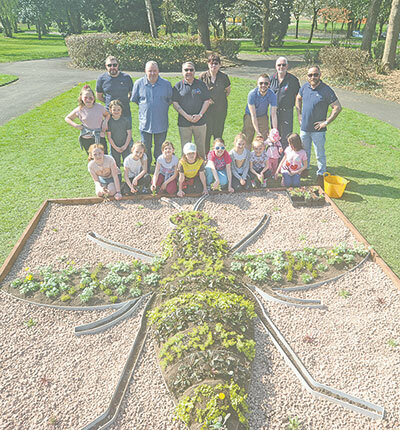 The permanent flower bed in the shape of a bee was designed to serve as a floral tribute. A plaque was also set to be installed to remember whose who tragically lost their lives. Tameside Armed Services Community (TASC) had been working with schools, colleges, community groups, businesses and families affected by the attack to plant the sustainable flowers. TASC applied for funding from the We Stand Together Fund and late last year / earlier this year, members spent a weekend with students planting the cuttings for the flowerbed. The final outcome includes more than 1,000 plants. Twenty-two people died and many hundreds were injured after terrorist Salman Abedi detonated a suicide bomb at the Ariane Grande pop concert at Manchester Arena on May 22 last year.